Start to finish…using beautiful reclaimed bricks. A nod to New Orleans! Just finished and ready to enjoy! This newly built home has a garage in back off the alley but no backyard. Everything is out front and exposed. The owner wanted curb appeal, that was simple, with neat lines and easy to maintain. There was also a need for a place to hide trash cans. We often get vague desires from clients and when they give us enough freedom, we can create some rather fun spaces. In Houston a screened porch is a great place to enjoy being outside without being eaten alive by mosquitoes. I still felt that it needed a space that invited you out in to the garden, especially on those beautiful spring days when the air is dry and there is a slight breeze. Breaking the yard into two spaces allowed us to make a courtyard area with just enough room for a couple of chairs and a cafe table. 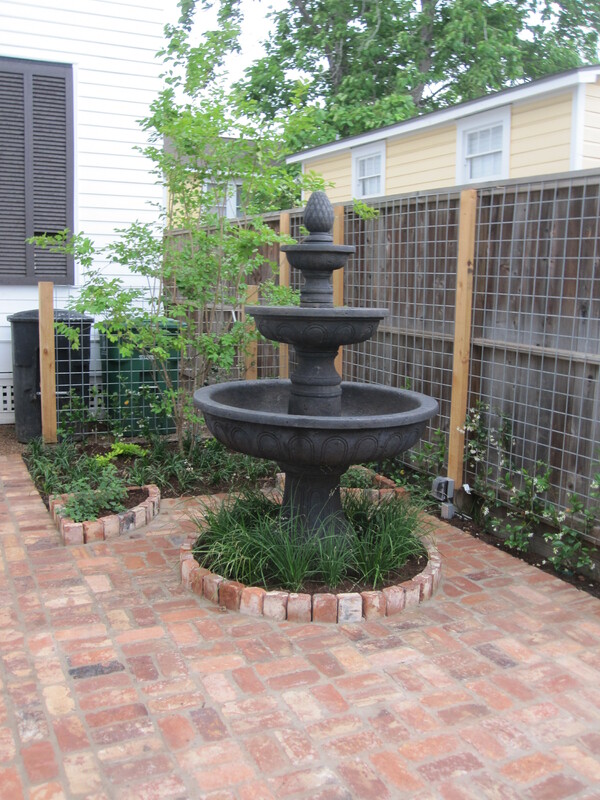 We installed an over-sized fountain so it can be enjoyed from the screen porch as well as the little courtyard. The fence is new. 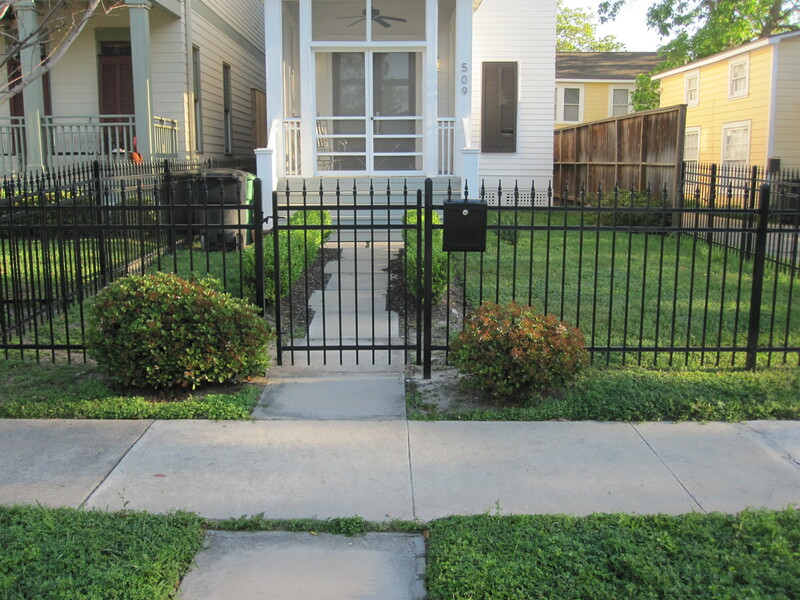 Previously it was a more confining white picket fence. We start below ground doing the most disruptive and messy work first. 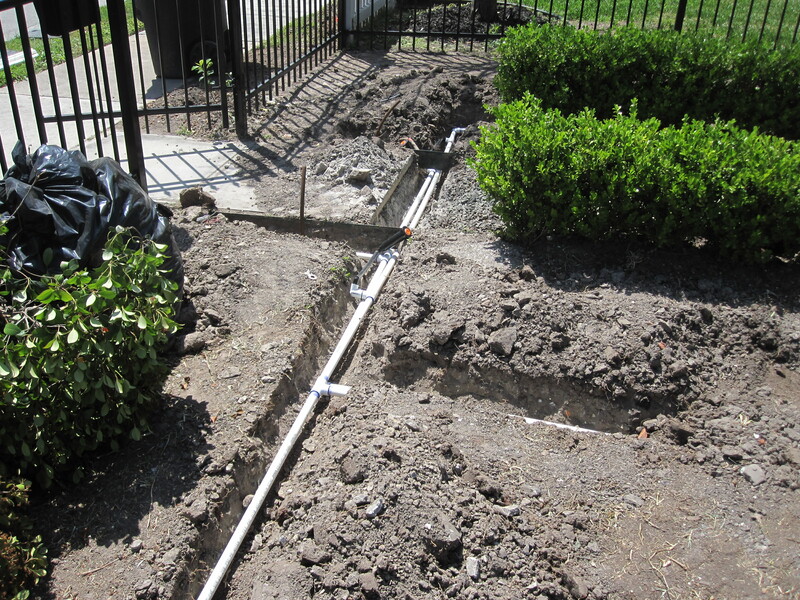 Trenching for irrigation and drain lines needs to follow the parameters of the design. This takes good planing and often some creativity. In the state of Texas you are required to have a license to install an irrigation system. One thing we like to keep in mind is the future in terms of possible repairs or adjustment. After striping the grass we start with irrigation. 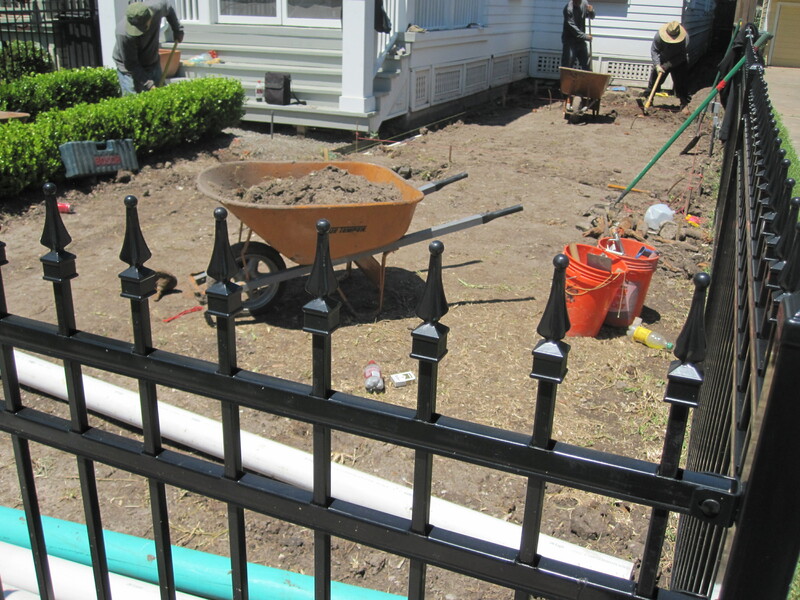 Once our sprinkler system passes the inspection we cover up the trenches and move further on to the hardscape. Note the strings; these guide the setting of the bricks as they denote the perimeter as well as the slope our patio will take. See the slight hole in the photo below and the surrounding bits of wood. This hole got much bigger as the project continued and we worked to grub out the remnants of an old tree that had been taken down three years before. Below is a process shot. The crewman with the large hat is still working on the tree stump. This is the second day we worked on that stump…there were a few more to go before we could plant there! Work in progress, trenches covered. The patio has certain parameters it must adhere to also. 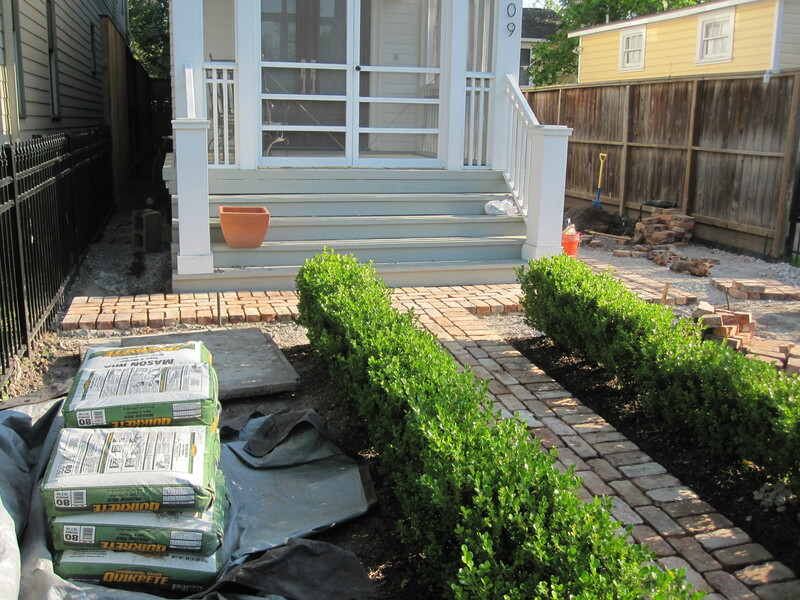 The face of the patio needs to align with the front path, so that is where we start laying the bricks. These are reclaimed bricks we found at Western Brick and have patina and some wonderful irregularities that add character to a newly built home. 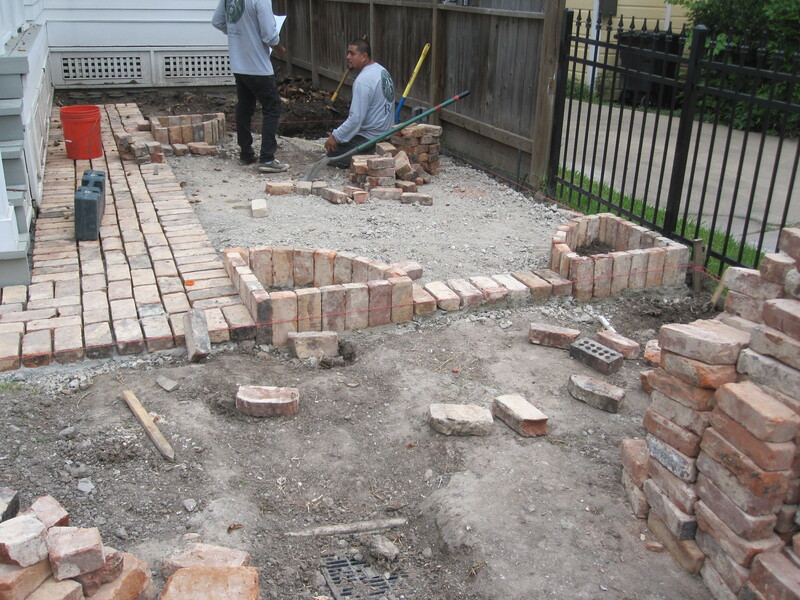 In the photo below we have crewmen working on the back two quarter-circle beds with the edging bricks on end. 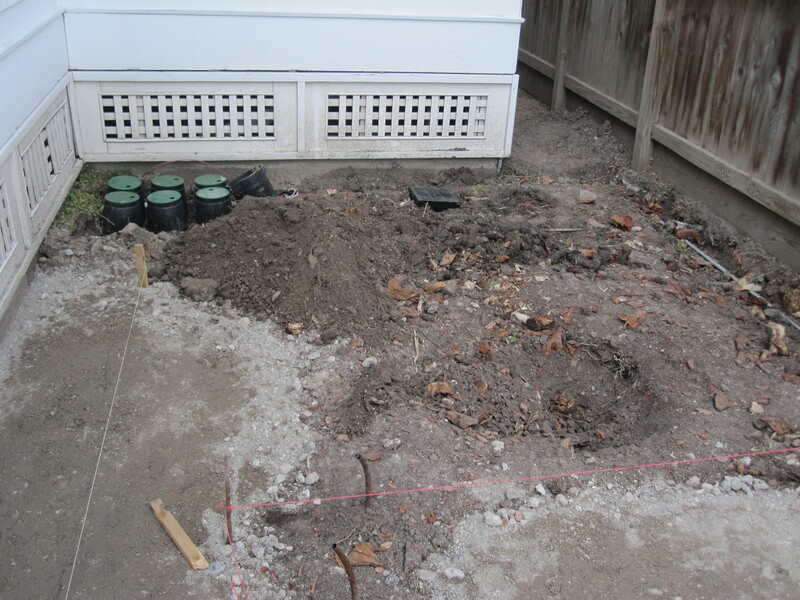 Secondly, the rear part of this patio had to allow room for a bed (where the tree we are removing was) that was large enough to allow for future plantings and the space to hide the trash cans. This is all drawn and measured in the design but there are, often as not, surprises that require adjustments. For example what line to you go off when the the lines of the house are not perpendicular to the street or parallel to the side fences. Working out the design in the small brick patio. Because the yard was small, and there was a fence at the front of the property, we had to make sure to not have crewmen stepping all over one another, or on freshly laid bricks. In this job we had only a couple of men working on the approach, as it came to the public sidewalk. This way we could keep weight off of this high-traffic section until it had time to set. We use ready-mixes of concrete and mortar. Working with small batches allows us time to get everything as precise as possible. The downside is working with these small batches does drive up our cost. The upside is it helps us keep a neater work-site and less chance of errors; a trade we are happy to make. 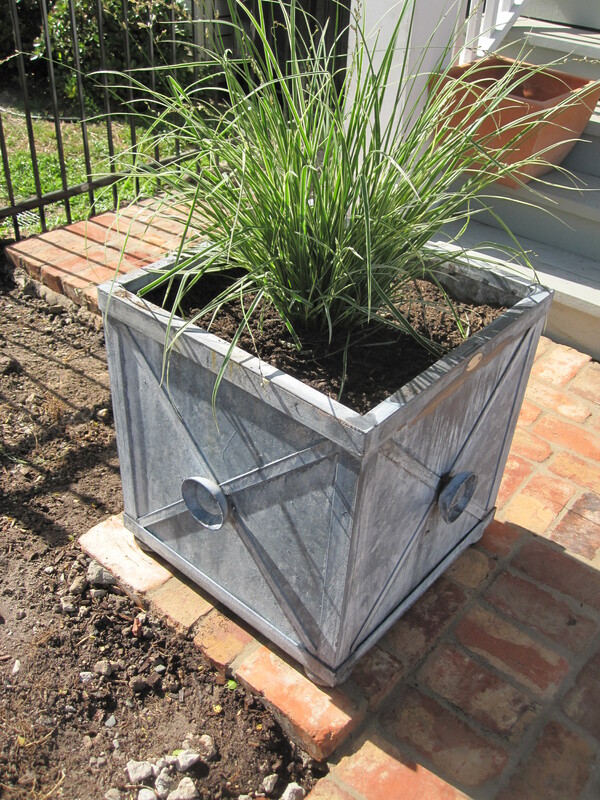 Laurin (the Designer) and the moving force of this blog, found these great planters from Branch. We included little brick pedestals for them to sit on in the design. While the pathway slopes down to the front gate these pads are square and level. 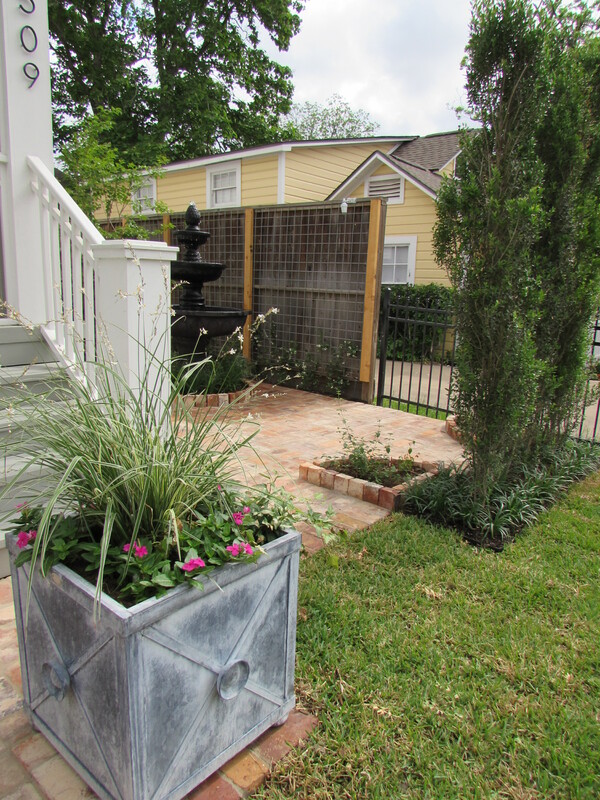 These planters were no after-thought; they were delivered about a month before the project started and we got to enjoy them in our backyard as sculpture for that time. Jackie Planters from Branch Studios. A quick aside about planters, public spaces, and theft: This project is in a pedestrian-heavy area with many residential construction sites around (remodeling, landscaping, building, etc.) And, while they are heavy of themselves and even more so with soil, we filled the bottom of the planters with a few levels of bricks to make them rather difficult to run away with them. 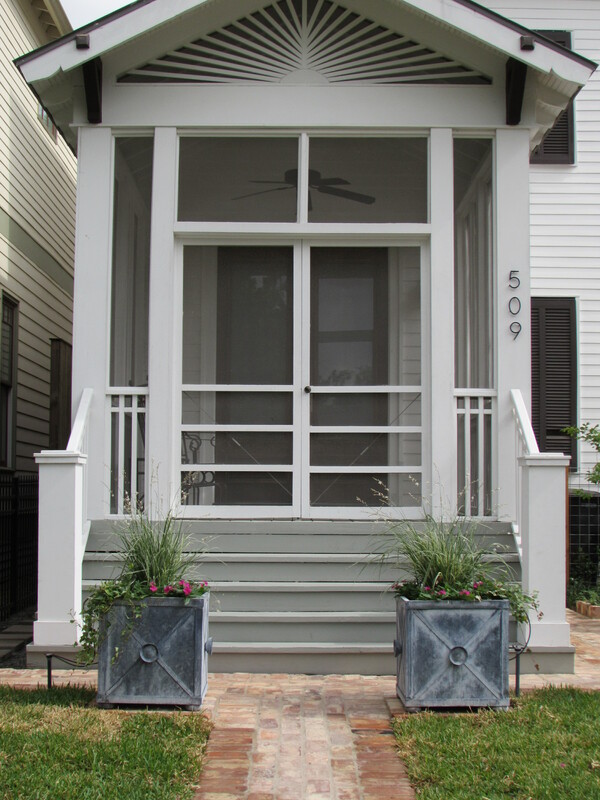 The client loves the planters, and in the over all design they are meant to draw your eye and invite you to the front steps. We are all pleased to have admirers, we just work to keep them where the client wants them without chaining them to the bannisters 😉 They are watered on there own zone in the irrigation system from little emitter tubes that are tucked up near them. Once the hardscaping is well underway we can play in the beds. We bring in sandy soil (premium mix from Cowboy Trucking) and add our organic supplements to help kick-start the beneficial ecology. We edged both of the front beds with Baby Gem boxwood which only want to grow up to around 24″, but would like them kept to 1 foot. The rear hedge, just inside the fence, is loropetalum which will be clipped to a foot or so above the height of the plants outside the fence to create a triple hedge. The plants sandwich in between are Shooting Star lilies. Their botanical name is Anthericum saundersia (‘Variegata’). We love the way their little white-star flowers dancing in the breeze. The over all effect is to define the property line without being so tall as to be un-neighborly. These are all easy to maintain and once established are quite hardy through both frost and drought. And being watered with drip tubing which is tucked under the mulch means they are being watered very efficiently. 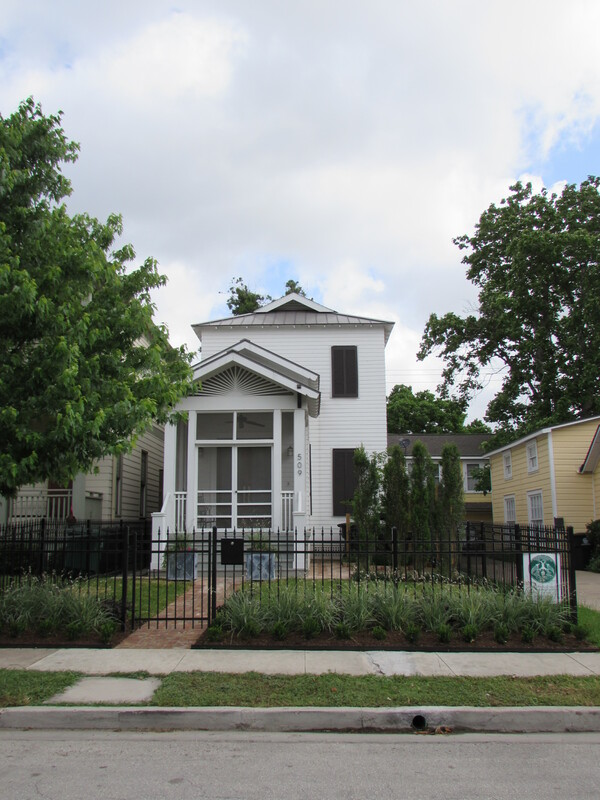 Front beds planted with Baby Gem boxwoods and Shooting Star lily. 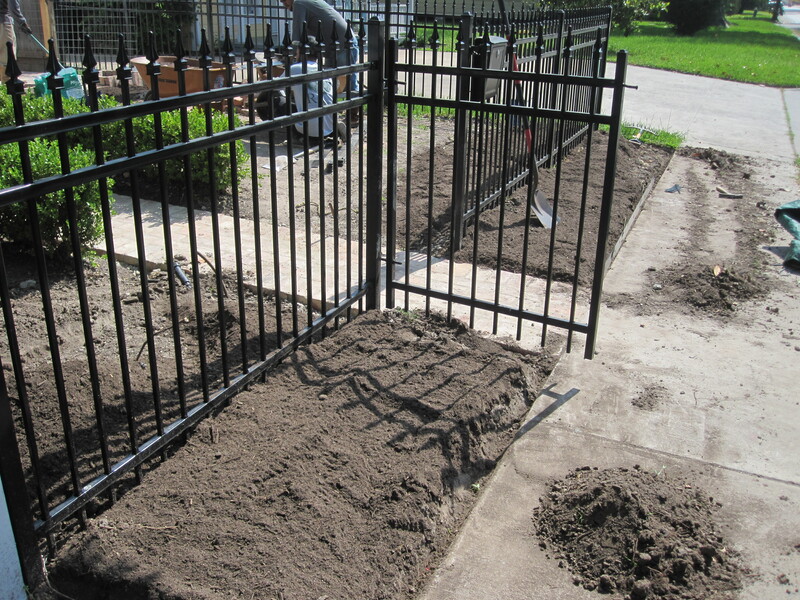 Inside the fence are loropetlum with a liripoe border. Here, we see the unveiling of the over-sized fountain! Remember we wanted a feature that could also be enjoyed while sitting on the screened porch. To give you a sense of scale it is 72″ tall. A simple screen on the fence will give the star jasmine a frame to climb upon and hide the fence in a couple of years. A 45-gallon Natchez crape myrtle is centered in the bed behind and will create nice shade and seasonal interest as it matures. 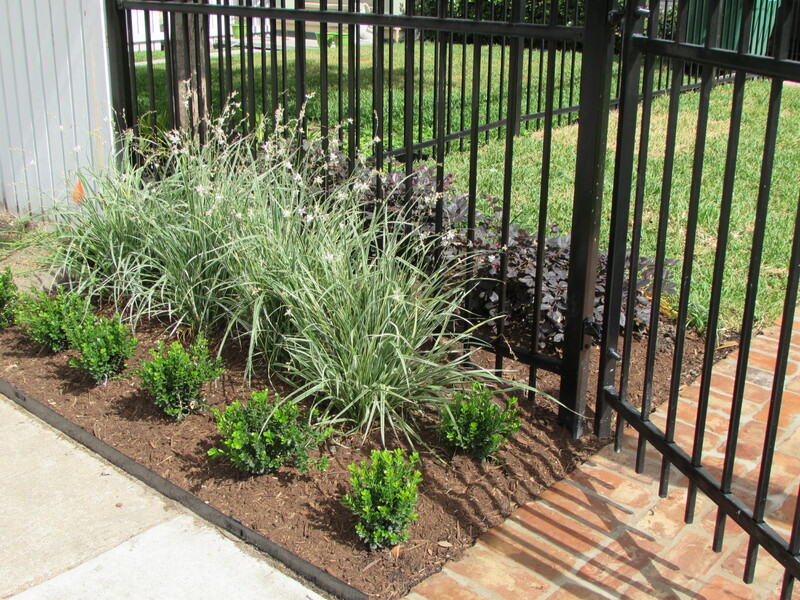 A low screen was constructed behind this bed, also planted with Star jasmine, to create a second green wall. We kept this screen lower to allow the client to see the garden and fountain from the window behind. Note the trash cans, in a year they will be hidden behind a green wall. This is the view from the house out towards the street. The 30 gallon Scarlet Peak holly hedge is already helping to create a little private niche on the patio. These are new to our market and wonderful for small spaces. They only want to be 3′ wide and 20′ tall. In a few years they will further screen this side yard. Below the fountain are Shooting Star lilies that are not variegated, just to have variation on a theme. They do not have blooms just now but will bloom all summer long. A welcoming approach to the front door. A final look, from the street, shows just how much the fountain and courtyard are obscured. The client is very please and loves all the little details of her low maintenance orderly yard. As usual Monday’s blog is a collaborative effort between Shawn and Laurin, just like this install. More pictures on our Houzz board.